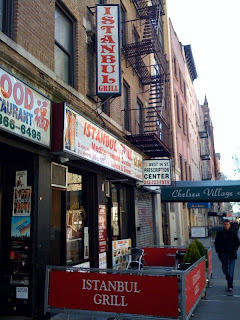 Istanbul Grill on W 14th Street at 8th Ave serves affordable Turkish food and is one of our favorite neighborhood hole-in-the-wall joints. We've only eaten inside the small restaurant once, but we've had Istanbul's food delivered to our door a dozen times for dinner. Here's the reason why Istanbul is one of our favorite food spots - their chicken kebab plate, which is different from any chicken kebab plate we've had. The chicken is always tender and cut perfectly, and it's served with great rice, onions, tomatoes and lettuce. The portion is also very generous. 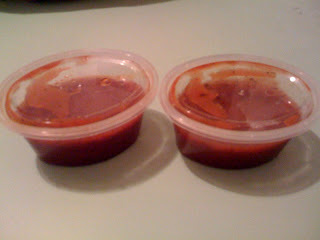 And the chicken kebab is made more perfect by Istanbul Grill's red sauce - sweet and almost like a ketchup and light peppery barbeque sauce mix. 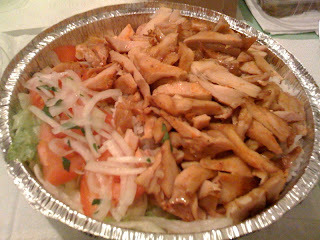 Istanbul Grill's lamb and falafel are also good, but the chicken is really the only thing we normally order from here. 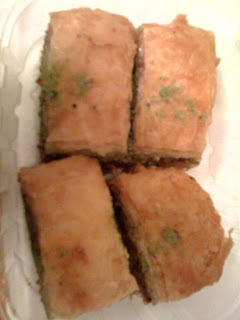 But their baklava is a bit of a let down - a bit too gooey and soggy. This particular plate tasted a few day past its prime. 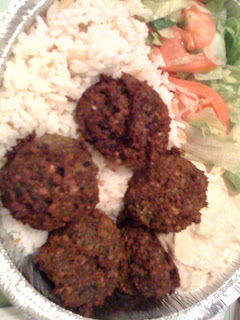 And their pita bread and hummus are just average. Like we said, it's all about their chicken kebab plate for us and we're all about getting plentiful, affordable food delivered to our door in under 15 minutes.